This PDF 1.4 document has been generated by Writer / OpenOffice 4.1.2, and has been sent on pdf-archive.com on 23/04/2018 at 02:40, from IP address 76.100.x.x. The current document download page has been viewed 132 times. File size: 190 KB (12 pages). 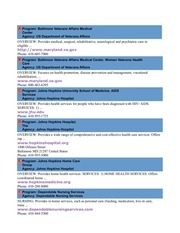 OVERVIEW: Provides health services for people who have been diagnosed with HIV/ AIDS. OVERVIEW: Provides medical services and support groups for individuals and families in need. Uzbekistan Vanuatu Venezuela Viet Nam Virgin Islands, British Virgin Islands, U.S. This file has been shared by a user of PDF Archive. Document ID: 00759852.